Here you’ll find travel reports about Grimsby. 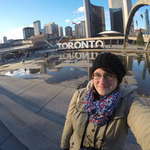 Discover travel destinations in Canada of travelers writing a travel blog on FindPenguins. Gestern haben wir nicht viel unternommen. Haben uns um meine Cousine und meine kleine Baby Großcousine gekümmert. Man hat von oben einen Wahnsinns Ausblick. Toronto allein ist schon riesig, aber mit den dazugehörigen Vorbezirken noch viel größer, das kann man sich gar nicht vorstellen. Der Ausblick auf den Ontario See war wunderbar. Es war als würden See und Himmel am Horizont ineinander verschmelzen. Für alle die es nicht wissen, der Ontario See ist so groß wie Österreich. Jedenfalls Flug war gut aber lang genauso wie mein gesamter Tag. I woke up in the early hours with what I thought was just a touch of travelers' tummy, known in Egypt as the Pharoah's revenge. I thought I could shake it off, and despite having no appetite at breakfast (which should have been a huge clue for me), I popped an Imodium and climbed on the bus at 6:30 a.m. with the rest of the group for the 3 hour bus ride to Alexandria. Alexandria is located north and a bit west of Cairo and is located on the Mediterranean Sea. The road there is a 3-lane highway going each direction where the cars and trucks pretty much stay in their lanes (unlike in Cairo), but pedestrians constantly dash across the lanes. Insanity. You get fined for that kind of crazy behaviour in Canada. Our first stop was the catacombs of Kom El Shoqafa (meaning "Mound of Shards") - a historical archaeological site considered one of the Seven Wonders of the Middle Ages. No photos allowed. The necropolis (burial chamber) consists of a series of Alexandrian tombs, statues and archaeological objects of the Pharaonic funeral cult with Hellenistic and early Imperial Roman influences. Due to the time period, many of the features of the catacombs of Kom El Shoqafa merge Roman, Greek and Egyptian cultural points; some statues are Egyptian in style, yet bear Roman clothes and hair style whilst other features share a similar style. A circular staircase, which was often used to transport deceased bodies down the middle of it, leads down into the tombs that were tunneled into the bedrock during the age of the Antonine emperors (2nd century AD). The facility was then used as a burial chamber from the 2nd century to the 4th century, before being rediscovered in 1900 when a donkey accidentally fell into the access shaft. To date, three sarcophagi have been found, along with other human and animal remains which were added later. It is believed that the catacombs were only intended for a single family, but it is unclear why the site was expanded in order to house numerous other individuals. By this time, I was feeling terrible. I felt like booking a spot for myself in the catacombs. Clearly, this was more than travellers' tummy and more clearly, I should have stayed back at the hotel. I was causing needless worry to all my fellow travellers, and especially to Mostafa. I stayed on the bus for the rest of the day. I took advantage of every toilet break. Every washroom was miserable and dirty with no running water for hand washing. I'm surprised we didn't all get bubonic plague. The group stopped to see Pompey's Pillar. Pompey's Pillar is a Roman triumphal column, the largest of its type constructed outside the imperial capitals of Rome and Constantinople, located at the Serapeum of Alexandria. The only known free-standing column in Roman Egypt which was not composed of drums, it is one of the largest ancient monoliths and one of the largest monolithic columns ever erected. The monolithic column shaft measures 20.46 m in height with a diameter of 2.71 m at its base. The weight of the single piece of red Aswan granite is estimated at 285 tonnes. The column is 26.85 m high including its base and capital. It was built in 297 AD to commemorate the victory of Roman emperor Diocletian over an Alexandrian revolt. The Crusaders wrongly believed that the pillar marked the burial site of Pompey and hence the erroneous name. Today the single column marks the site of what was once a huge and elaborate temple, which was constructed of marble and decorated with precious metals on the interior. Next stop - Montaza Palace, according to the pictures Doug took. Montaza Palace is a palace, museum and extensive gardens in the Montaza district of Alexandria, Egypt. It was built on a low plateau east of central Alexandria overlooking a beach on the Mediterranean Sea. The larger Al-Haramlik Palace and royal gardens were added to the Montaza Palace grounds, being built by King Fuad I in 1932, as a summer palace. It is in a mixture of Ottoman and Florentine styles, with two towers. One of these towers rises distinctively high above with elaborated Italian Renaissance design details. The palace has long open arcades facing the sea along each floor. The Al-Montaza Park, the former expansive royal gardens of 150 acres, are open as a public landscape park and forest reserve. My fellow travellers enjoyed seeing them. The bus stopped by the Mediterranean Sea - always a lovely blue colour. I was able to open one eye and verify that. Doug and I loved seeing the Mediterranean when we were in Nice, France a few years ago. We were at the site of the The Lighthouse of Alexandria, sometimes called the Pharos of Alexandria - this was a lighthouse built by the Ptolemaic Kingdom between 280 and 247 BC which has been estimated to be 100 metres in overall height. One of the Seven Wonders of the Ancient World, for many centuries it was one of the tallest man-made structures in the world. It was badly damaged by three earthquakes between AD 956 and 1323. The stubby remnant disappeared in 1480, when the then-Sultan of Egypt, Qaitbay, built a medieval fort on the larger platform of the lighthouse site using some of the fallen stone. Somewhere along the line, the group stopped for lunch. Lunch was on the tour operator's tab because of a bobble in the tour plans. Doug raved about the good chicken he had in the restaurant overlooking the Mediterranean Sea. We were originally supposed to stay overnight in Alexandria, and then go back to Cairo for one more night for us, two more nights for everyone else. But the Egyptian government bumped all the hotel room reservations in Alexandria for a big conference, so we had to endure the 3 hour bus ride back to Cairo. I spent some of the trip splayed out on the 5 seats along the back of the bus. I was just barely hanging on. Actually, being back in Cairo was a far better place for me than being stranded in Alexandria. We got back to Cairo about 7:30 p.m. I crawled to our room. We had been given a room with two separate beds when we checked in. The hotel had offered to move us to a room with a king sized bed for the last three nights, but we had declined the offer, feeling it was just not worth the effort. A fortuitous decision, because one of those beds turned into a hospital bed. Doug arranged for the hotel doctor to see me - I had constant diarrhea and now was running a fever. We were way past travellers' tummy. During the return from one of my numerous bathroom trips while we waited for the doctor, I passed out and ended up on the floor, uninjured thanks to Doug. Doug escalated my case to an emergency and called Sharon, a fellow traveler who is also a nurse. She nursed the nurse who was busy nursing his wife. In 18 short hours, I had gone from fine to very, very sick. Oh Maureen. How awful! But Dr. Matawea sounds like a godsend and Doug was your angel. Apr 20 - Home - finally!! We made our 1:30 a.m. flight to Dubai and I survived it with no major incidents. I really, really didn't want to be the reason the plane would have to make an emergency landing and my face would get plastered all over CNN. No, thank you. I'll pass. The rest of the group was staying overnight in Cairo and heading out on a 10:00 a.m. flight to London, having a 5-6 hour layover, and then onto Toronto. We were going to be home before they would be. I still had very little appetite but I concentrated on continuing to get fluids into me. In Dubai, I felt decent and brave enough to tackle the long flight. No chance of an upgrade - the flight was fully booked. We took a deep breath and headed into battle. Because I was still wired on meds, I was awake the whole flight, and because Doug was so on edge about me, he was awake the whole flight. I watched four movies - Marshall (about Thurgood Marshall's early days as a NAACP lawyer), The Shape of Water (best picture Oscar winner), Three Billboards Outside Ebbing Missouri (rough language) and On Wings of Eagles (about Eric Liddell of Chariots of Fire fame when he was a POW in China). The flight was blessedly quite smooth, although had the "feathering" of the aircraft coming into Toronto lasted much longer, Doug would have been in trouble. We used our new Nexus cards that deem us to be "trusted travellers" to access the Nexus gate that had no line up and thereby bypass the long lines at passport control. Those cards are the best $100 each we've spent in a long time. The kind officer helped us to figure out how to claim the rug that was coming. We saw some piles of snow at the airport - the vestiges of a vicious ice storm that had slashed through Ontario the previous weekend, causing traffic havoc and power blackouts and fallen trees. We missed it all! Sweet. On the drive home (about an hour), we revelled at seeing orderly traffic with no donkey carts or tuk-tuks and no pedestrians zig zagging across the highway. We were home safely by 7:00 p.m. and ever so happy. There is nothing, just nothing like home. Epilogue - my gastrointestinal system got a bit better each day and I finished the medications on Sunday night. I still wasn't sleeping well because of one of the meds so adjusting to the jet lag was a lost cause. Monday morning - I woke up covered in a red, itchy rash. Great - an allergic reaction to either one of the drugs, or a combination of two or more of them. Couldn't get into see our family doctor, so we went to a walk in clinic and got Prednisone, a powerful steroid to combat the spread of the rash which was heading swiftly towards my face and throat and could have hit me with anaphylactic shock at any time. The Prednisone slowed things down. By Tuesday, I was still a mess, but at least anaphylactic shock seemed to be no longer imminent. The rash was trying to spread down my forearms and down below my knees. I spent a lot of time oatmeal baths and having Doug slather me with a non-steroidal based ointment recommended by the pharmacist. The Prednisone makes me jumpy and almost twitchy, so no chance of sleep while taking it. The doctor gave me sleeping pills but they couldn't seem to make a difference. Good thing the newspapers come nice and early because I was up at all kinds of weird hours. Saw our family doctor on Wednesday and gave him the whole sordid story. He prescribed anti-itch pill to use at night that induces drowsiness. I actually slept properly on Wednesday evening. He's going to refer me to the Adverse Reactions Clinic to get to the bottom this wicked reaction so that we can avoid it in the future. By Thursday, I was on the mend, with the rash mostly receded, but lots of weird blotchiness still remaining. What an ordeal! And as if that wasn't enough, Doug brought home a cold from Egypt. He's getting better now but has sounded like Kermit the Frog for a few days. He refereed a couple of basket ball games yesterday with virtually no voice. Used a lot of hand signals I guess. And so, our big Middle East adventure is over. We enjoyed so many things - seeing Patty and Bob in fascinating Dubai; visiting several World Heritage Sites; riding Casa Nova the Camel in sight of the iconic Great Pyramids; floating down the Nile River; and seeing sites of significance from the Bible. Visiting the site of the baptism of Christ was very spiritual moving for me. It was truly a memorable trip, with a bit of a bobble on the end, but we got through it, with a few valuable lessons learned. We were delighted to travel in small group where we could get to know one another. We wish all our fellow travellers wonderful future adventures. And to all of you who have patiently followed this blog, I say thank you. Apologies for the delay - it took me several days to be able to concentrate well enough to tackle finishing this blog. Go back to about April 15 - that's where the first posting from Cairo was when I first encountered slow upload speed. It has been a pleasure having you along for the ride. I hope you have learned some things about Dubai and Jordan and Egypt. May you too continue to enjoy learning about this fascinating world of ours. So glad you are OK. I enjoyed following with you hrough your blog. Hope to see you in class on Monday. Finally - our big adventure in the Middle East has begun! We will be spending a week in Dubai visiting with Doug's sister Patty and her husband Bob. They have been in Dubai for almost 4 years now where Patty has been teaching. From there, we will fly to Amman, Jordan and join up with a10-day tour run by Biblical Journeys Canada to visit sites in Jordan and then Egypt. The timing of the tour dovetailed perfectly with Patty's school break so it seemed as if it was meant to be. Dr. Ahmed had left me Tuesday evening in Doug's capable hands. I shudder to think what would have happened had I been traveling alone. Neither of us got much sleep - I was still making frequent bathroom trips and discovered later that one of the drugs I was taking induces insomnia. Just my luck. Dr. Ahmed arrived back in the morning. My blood pressure was better (not great) so I got another litre of IV fluids. I thrashed around all day. Another visit that night. Another 1/2 litre of IV fluid. My blood pressure was finally normal and my other vitals were good. I still felt like trash - incredibly weak and with absolutely no appetite - a first for me and I was still not sleeping at all. We were now at Wednesday evening. We were facing a deadline of leaving for the airport at 9:00 p.m. on Thursday for our 3-hour flight at 1:30 a.m. flight on Friday for Dubai. From there, we were supposed to fly for 14 hours to Toronto. Because we had flown from Toronto to Dubai, we needed to fly back out of Dubai, otherwise we would have incurred a huge financial penalty. Going ahead two time zones, only to then go back eight time zones seems odd, but that's what we had to do. Dr. Ahmed promised to see me Thursday morning and again Thursday evening when he would make a travel/no travel decision for me. Through all of this, Doug was working on logistics. The tour company sent a representative, Nasser, to talk with him. We were supposed to have just stayed at the airport on Thursday after our return from Luxor, but that obviously wasn't go to happen. If I got cleared to travel, he would arrange to send a minivan with a driver along with Walid who would guide us through the airport. Nasser negotiated with the hotel who agreed to let us stay in our room at no extra cost until we had to leave for the airport. The restaurant staff were very kind and helped Doug pack up a few things that he thought I could manage to eat. They gave him a carton of apple juice too and a few bananas. They keep them out of sight, otherwise they get snapped up by the armful by the guests. The Housekeeping staff were wonderful too, keeping us supplied with towels and bottled water and respecting our need for quiet. Trust me, I wrote a lot of thank you notes when I got home. Everyone was so incredibly kind and helpful and cooperative - customer service at its finest from the hotel, the tour company and the medical clinic that services the hotel. I suspect that the rest of the group went to the Grand Egyptian Museum (GEM), also known as the Giza Museum, a planned museum of artifacts of ancient Egypt. Described as the largest archaeological museum in the world, the museum is under construction and is scheduled to be partially open in 2018 exhibiting the full Tutankhamun collection with many pieces to be displayed for the first time. The museum is sited on 50 hectares (120 acres) of land approximately two kilometers from the Giza pyramids and is part of a new master plan for the plateau. The architectural competition was won by the company Heneghan Peng from Dublin, Ireland. Love my little leprechaun friends! By Thursday morning, I could sit up in bed, but was still completely wrung out. Vitals all stable. Progress. At the 8:00 p.m. check up, I was actually sitting up on the side of the bed. I was practising for a full day of sitting up in airline terminals and on planes. Dr. Ahmed was mightly impressed. What a vision of beauty I must have been with my sweat-encrusted three-day old bed head and now sporting Doug's oversized t-shirt from a local microbrewery. Dr. Ahmed gave me the okay to travel. Now, being medically cleared for traveling and actually feeling like traveling are two very different things. I was still rather light headed and had no energy, but the lure of my own bed was very strong. Along with a few prayers and a firm focus on home, we packed up with a survival kit for me and set off, I in a wheelchair to preserve what little strength I had. The driver and Walid met us in the lobby and ushered us into a minivan. It took about an hour to get to the airport. Cairo is a weird place on a Thursday night (like our Friday night) - discos blaring music, huge neon billboards lit up, donkey cards in the noisy, loud traffic and women begging with their children around them on the road medians. Sad. Sad. Sad. Walid ushered us into the airport. Walid, because he is a licensed tour guide, was allowed to come past security with us. Even though the check-in desk had just opened, the lineup for economy class was already a mile long. The lineup at First Class was very short. Walid asked if we were flying First Class. “Only in my dreams,” I replied. So, Walid strode up to the First Class check-in desk, explained the situation (not in all its gory details) and asked if we could check in via the First Class desk. I might have been able to stand long enough in that short line. The Emirates airline agent, bless his heart, actually allowed us to jump to the head of the First Class queue. We were through booking in one minute flat. That’s probably the closest we’ll ever get to First Class. What a blessing to have Walid as our shepherd! We walked slowly to our gate - getting a wheel chair in that airport is nigh on impossible. Our attention to mobility issues in Canada and the US is far superior. I wasn't feeling any worse, and my gastrointestinal system seemed just stable enough to take a stab at this trip. Our backup plan was to assess my condition in Dubai and if I felt I couldn't survive the flight to Toronto, that we would stay with Doug's sister and brother-in-law for a few days. So, while all of this was going on, the most of the rest of the group headed to Luxor. Paul and Cathy had been there last year as part of a cruise and opted to spend the day around the lovely pool at the hotel. Side bar - Paul ripped his leg open when he got attacked by a lounge chair on Monday night and received treatment and one of those fancy IV ports from Dr. Ahmed. We can both attest to Dr. Ahmed's wonderful manner. The group had a 3:00 a.m. wakeup call for their 7:00 a.m. flight (about one hour to Luxor in the south of Egypt). We had cancelled our wake up call, but got it any way - just when I had finally fallen asleep. That was about the only bobble made by the hotel. Day 1 - Oct 19 - We're off! Finally, our epic Australian adventure has begun. We left Grimsby at 8:30 a.m. in a Niagara Air Bus limo - much more comfortable than the bone-shaker mini-bus that makes several stops along the way. That's how I got to the airport when I went to Italy. We will have the limo pick us up in 6 weeks when we land at Toronto close to midnight. Our flight Air Canada flight #101 left at 12:30 p.m. and got into Vancouver at 2:35 p.m. Pacific time - there is a 3-hour time difference. We had almost 5 hours to use up before our Air New Zealand flight to Auckland which left at 7:15 p.m. We opted to fly with Air New Zealand because they have Premium Economy seating - wider seats, but more importantly, more leg room. The flight to Auckland was almost 14 hours (sigh). Thankfully, we both managed to sleep some. We arrived in Auckland at 5:00 a.m. on Friday morning because we lost a day when we crossed the international date line and we crossed 4 more time zones. We were delayed about 40 minutes getting off the plane because the jetway (the tunnel/ramp thing that connects the plane to the terminal) wouldn't work properly. So, we had to be towed to another jetway, but before the tow could start, the pilot had to do his entire pre-flight check list. Some people with tight connections were understandably narced. The flight attendant said it was the first time in 17 years of flying that she had ever seen a jetway failure. We had a 4-hour layover before our flight left at 9:00 a.m. It arrived in Sydney at 10:35 a.m. There is a 2-hour time difference between Auckland and Sydney. The flight to Vancouver was quite smooth until we crossed over the Rockies - we had some turbulence there, but Doug handled it quite well. There was turbulence over the Pacific and the landing in Auckland was quite bumpy, so Doug was not in good shape there. We found a lounge with couches and he slept some which helped him get ready for the next flight. The landing in Sydney was really smooth, so overall, Doug is in very good shape. We have discovered the joys of noise-cancelling earphones. They block out most of the noise of the aircraft even when you aren't listening to music or a watching a movie. Air New Zealand Premium Economy rocks. The seats were really comfortable and the leg room was wonderful. The seats reclined and had a large footrest. The food was really good. In the breakfast, there was fresh fruit salad, yogurt and warm croissants. I passed on the scrambled eggs and pancakes.